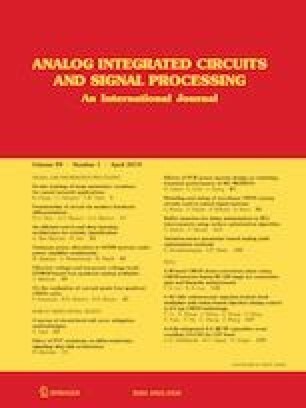 This paper reports a three-stage four-way power amplifier for 94 GHz image radar systems in 90 nm CMOS technology. The PA comprises a common-source (CS) input stage and a CS gain stage with wideband π-match input, inter-stage and output networks, followed by a four-way CS output stage using miniature dual-Y divider and combiner. Inductive shunt–shunt feedback technique is used at both the input and gain stages to enhance gain, which in turn leads to a higher output power (Pout) and power-added efficiency (PAE). At each branch’s input terminal (i.e. the drain terminal of the parallel CS output stage), the dual-Y current combiner can convert the serial RL load to the optimal load impedance (corresponds to the optimal Pout and PAE) of the output stage transistors. At 94 GHz, the PA achieves power gain of 16.5 dB, Pout of 16.5 dBm, and PAE of 18.3%, one of the best results ever reported for a W-band PA in 90 nm CMOS. The excellent performance of the CMOS PA indicates that it is suitable for 94 GHz image radar transceivers. This work is supported by the Ministry of Science and Technology (MOST) of the R.O.C. under Contract MOST105-2221-E-260-025-MY3. The authors are very grateful for the support from Taiwan Semiconductor Research Institute (TSRI) for chip fabrication and measurements. Son, H. S., Jang, T. H., Kim, S. H., Jung, K. P., Kim, J. H. & Park, C. S. (2019). Pole-controlled wideband 120 GHz CMOS power amplifier for wireless chip-to-chip communication in 40-nm CMOS process. In IEEE transactions on circuits and systems II: Express briefs. https://ieeexplore.ieee.org/document/8527553.